In Titus Andronicus’s 2010 sophomore release, The Monitor, singer and lyricist Patrick Stickles takes a particularly ambitious tack in crafting a fully-realized concept album centered on a historical metaphor. As the first part of what will hopefully be a short series of posts, I’ll look at the album and consider its utilization of history for dramatic and thematic importance. Unsurprisingly, a group named after a Shakespeare play tends to be rather lyrically dense. As such, the opening song of the album, “A More Perfect Union,” is laced with references both contemporary and historical. The first verse references Simon and Garfunkel’s “America,” twists lyrics from Billy Bragg, and finishes by inverting Bruce Springsteen: “Tramps like us, baby we were born to die.” A later biblical allusion places the singer as a Christ-figure: “If I come in on a donkey, let me go out on a gurney.” Yet the most consistent thread begins in this song with the heavy usage of lyrics from the “Battle Cry of Freedom” and continues throughout the rest of the album: the metaphor of the Civil War. 2016 HGSA Conference CFP is Here! Masters and doctoral graduate students in any field of historical study are invited to submit proposals to present individual research papers at Loyola’s Thirteenth Annual History Graduate Student Conference. Panel applications and individual papers focusing on borderlands or transnational studies, urban history, gender history, and public history are especially encouraged. We also welcome papers about history projects in the digital humanities. The goal of this conference is to provide an opportunity for students to gain experience presenting original research projects and to receive feedback from their peers on their work. Certificates will be awarded to the top three conference presentations. Individual proposals should include: submitter’s name, contact information, institutional affiliation(s), a one page abstract of the paper (with a title), and a sentence listing up to three historical subjects your paper addresses (e.g. French history, sport history, gender). Please also include a brief biographical statement indicating your academic status along with a return address and current email address. Panel proposals should include the above as well as a brief description of the panel itself. Please note that submissions will be accepted as time and space permit. Please contact the HGSA Conference Committee at: HGSA@luc.edu with any further questions. Last year Fazila Kabahita and I decided to nominate the Ambidexter Industrial and Normal Institute in Springfield, Illinois, to the National Register of Historic Places as a part of our Historic Preservation course. Fazila and I learned that the Ambidexter Institute was modeled after Booker T. Washington’s Tuskegee Institute. Deemed the “Tuskegee of the North,” Ambidexter was a private industrial school intended to teach trades and provide academic education to African American students. It received the name “Ambidexter” because its founder, Springfield clergyman G.H. McDaniel, believed that the students would have to be ‘ambidextrous,’ (in some sense-suggesting that they would have to be doubly as skilled as whites) using both their minds and their might, in order to make it in competition for employment with the white labor force. McDaniel intended to “accomplish for the negroes of the north what Booker T. Washington’s great school is doing for the colored people of the south.” He opened the school in 1901 with funding from prominent Springfield residents. As we continue to work toward nominating the site through the Illinois Historic Preservation Agency, I thought I’d share a little about the history of the school and similar institutions that followed the Tuskegee model. Ambidexter Building Today. Photo by Patrick Yeagle. Movie-going offers a sort of timeless joy. Cinema enthusiasts a century apart share the experience of immersing themselves into the big, bright screen. The same wonder and suspension of belief attend viewing both a silent Chaplin film and Marvel’s next 3-D blockbuster. Even the popcorn has featured prominently for generations of filmgoers since the Great Depression. But the movie theater business has also undergone considerable changes as economic downturns and the advent of television have reduced box office lines. These challenges loomed even larger for small, older theaters which had to compete with the shiny new multiplexes with far more screens. All these factors make the continued existence of the theater at 6746 N. Sheridan Road, currently known as the New 400, all the more remarkable; it is arguably the oldest still-operating theater in Chicago. How has this comparatively-small location so far from the Loop kept projecting Hollywood magic for over a century? Two factors stand out: adaptation and community involvement. In 1912, architectural firm Grossman & Proskauer designed the Regent Theater as a vaudeville venue, but by December 1913 it was showing movies produced by the Mutual Film Corporation and soon advertised its film offerings multiple times a week in the Chicago Tribune. (A Mr. F.A. Duffield served as manager-owner in 1914; Duffield, previously a typographer for the Chicago Record-Herald, appears to have joined the movie theater business after the Tribune bought out his previous employer.) Although boasting 736 seats, the Regent, like most early theaters, only contained one screen. The theater served as an important hub for Rogers Park community activities; the Regent hosted a benefit for the Catholic Women’s Club of Rogers Park in 1913, and in 1914 showed patrons slides to raise money for a power boat to help lifeguards prevent drownings on Lake Michigan’s north shore. During World War I, the theater took part in the Four-Minute Men Program, where government spokesmen would use the intermission to appraise patrons of the war effort and encourage patriotic involvement. By all accounts, the Regent Theater was a high-class place, representative of a prosperous and active Rogers Park. The Broadway smash hit Hamilton: An American Musical, a “hip-hopera” about the nation’s founding, is a bona fide phenomenon. Tickets are nearly impossible to come by, and celebrities flock to every performance. (President Obama has seen it twice.) The show and its composer and star, Lin-Manuel Miranda, are receiving recognition for fantastic performances, an energetic blend of musical theatre tradition and hip hop innovation, and the choice to cast people of color in the roles of the lily-white Founding Fathers. But Hamilton is also being praised for its potential to teach its audience members, to get them excited about a period of history they may only remember from dry classroom lessons. Miranda based the musical on Ron Chernow’s 2004 biography of Alexander Hamilton, and the historian served as a consultant to the show. The Gilder Lehrman Institute of American History recently partnered with the Rockefeller Foundation to provide discounted tickets for low-income New York City high school students and develop accompanying educational programming. 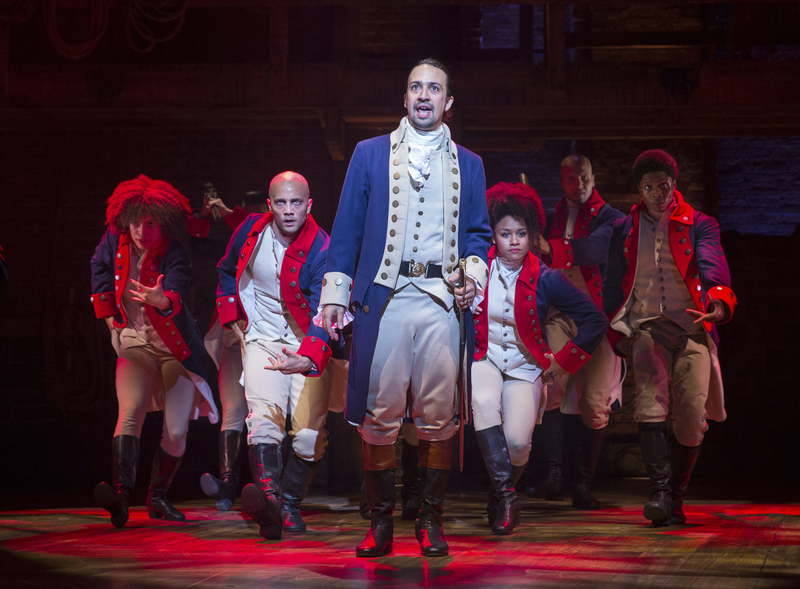 Hamilton is the latest in a long line of musicals based on historical events: 1776, Les Misérables, Evita, and the recently-opened Allegiance, about Japanese internment in the U.S. during World War II, among many others. So why has this particular show seemed to inspire its audiences, particularly those who are not otherwise musical theater fans, more than these other worthy musicals? In the digital age museums and archives have turned to the internet to find ways to reach larger audiences. Institution information such as hours of operation, events, and collections can be found online. Social media plays an important role in reaching audiences that may not otherwise seek out museums, historical sites, or archives. Events like #AskACurator and #AskAnArchivist encourage a social media collaboration of institutions worldwide to promote their respective professions. The more people taking part in the event and using a defined hashtag ultimately will help to move the hashtag up in the queue of trending Twitter topics. Trending hashtags reach even larger audiences because they are promoted within Twitter’s trending topics and are seen by people who may not have any idea that such a day existed. Experimental rock group Yeasayer released its second album, Odd Blood, in 2010 to a generally favorable reception. As compared to the band’s previous work, critics appreciated the foray into much more accessible pop sensibilities. But beneath the catchy hooks and upbeat affirmation of the album’s first single, “Ambling Alp,” lies a kernel of historical inspiration. Unlike the mysterious and somewhat impressionistic vocals of their other songs, the lyrical allusions of “Ambling Alp” reference a particularly notable figure in sports history: the great boxer Joe Louis, the “Brown Bomber,” heavyweight champion of the world from 1937-1949. 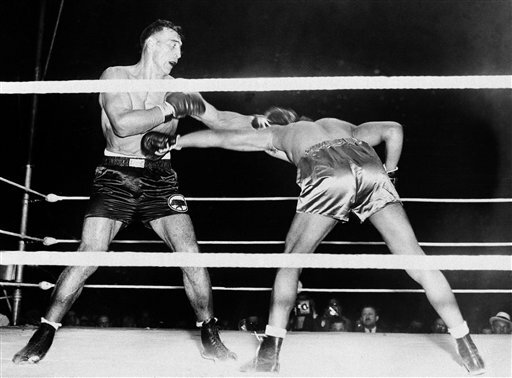 Oh, Max Schmeling was a formidable foe. Joe Louis fought Primo Carnera in 1935, the Italian boxer whose nickname, “The Ambling Alp,” provides the song its title. He knocked out the massive Italian in six rounds, with the powerful victory setting off his career. At that time he was still on his way to the heavyweight title, a road that would hit an unexpected bump in his first fight with German boxer Max Schmeling in 1936. Though few expected Louis to have any trouble, Schmeling handed Louis his first professional loss with a knockout in the twelfth round. Louis had underestimated his opponent, and Schmeling had carefully prepared. But the importance of the fight extended beyond the ring: Max Schmeling fought under the flag of the Nazi regime, and his victory made for excellent material in the Nazi propaganda machine. Though not a Nazi himself, Schmeling’s victory over Louis, a black American, was twisted into further justification for German theories of Aryan racial superiority.